Erected by Elizabeth Ryrie in loving memory of her parents. Donald Ryrie died 12th January 1879 aged 64. Wife Christina Adamson died 10th July 1886 aged 73. Son Robert S Ryrie died 10th May 1846 aged 14. Daughter Elizabeth Ryrie died 27th January 1936 aged 90. Son William Ryrie died 31st January 1915 aged 73. 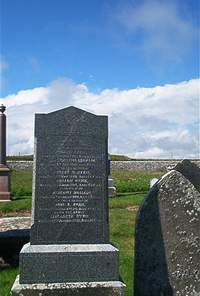 Wife Margaret Macleod died 13th December 1896 aged 58. Daughter Jane S Macleod died 7th December 1904 aged 27.